PLEASE ATTEND A VERY IMPORTANT MEETING THAT HAS BEEN SCHEDULED BY SUPERVISOR GONSER FOR MONDAY, AUGUST 31 AT 7:00 PM. THE MEETING IS AT THE TOWNSHIP HALL. THE PURPOSE IS TO APPOINT TWO NEW MEMBERS TO THE PLANNING COMMISSION THAT WILL HELP DEFINE OAKLAND TOWNSHIP’S FUTURE. Efforts will be made to get copies of the other’s applications and post them on this website so the citizens can review their credentials and experience as well. Supervisor Gonser is the one who nominates the individuals that are to be considered by the Board for the open positions. A number of people have applied for the positions. Some of these candidates have Township experience regarding Zoning, Planning, and other subcommittees in the Township, others do not. It should be noted that, per state law governing Township Planning Commission appointments, if the Board does not approve Gonser’s Planning Commission nominees, the currently seated Planning Commission members may continue to serve on the Commission if they agree to do so. Over the past two years, Gonser and the Board have replaced 5 of the previous Planning Commission members with new people. The Commission consists of 7 people. With the loss of the two that are scheduled to leave in September (Chair Jim Carter, and Secretary Janine Saputo), the most experienced Planning Commission member will only have two years of experience. In addition to the loss of the experience on the Planning Commission, our Township Planning consultant for many years, Larry Nix, has decided to discontinue his support of Oakland Township. He will continue to support other communities in Michigan. One final critical skill loss is that Elaine Leven, who has been our Township Planning Coordinator, has accepted a position as Marine City Manager. So, all of our experienced Planning people are no longer involved in Township Planning. This while our Township Planning Commission is responsible for updating our very important Township Master Plan. 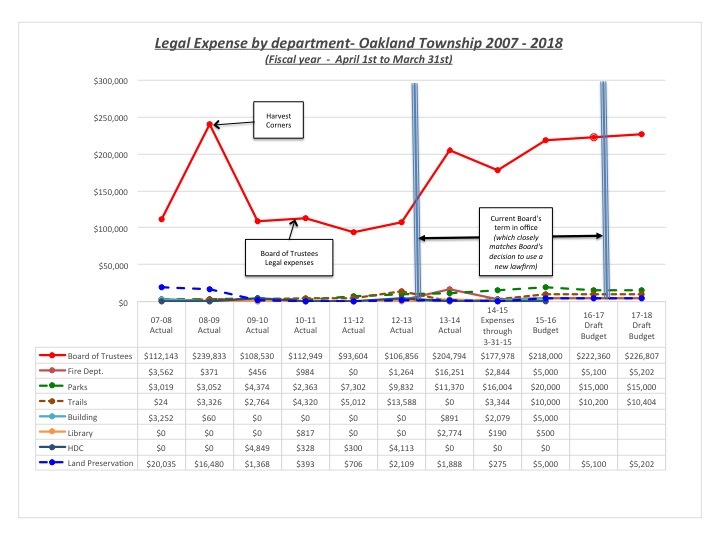 When the Board took office in 2012, there was close to (and possibly more than) 100 years of collective Oakland Township Planning experience between the Planning Commission members, the Planning Consultant, and the Township Planning Coordinator. If the Supervisor’s recommendations get approved, and when the Planning Consultant and Planning Coordinator leave. We will have less than 10 years of collective experience working on our Master Plan. As I stated earlier, there are several candidates that have Planning Commission, Zoning Board of Appeals, Township Subcommittee experience or even Township Board experience that would serve the Township well by being appointed to the Planning Commission. Your participation in the August 31 meeting is critical in making sure that the Supervisor chooses wisely in his nomination, and that the Board only approves individuals that have demonstrated their knowledge and willingness to add much needed experience to the relatively inexperience Planning Commission as we work on our Township Master Plan. Why is this important to the citizens of Oakland Township? Simply put, the future character of our Township is at stake. Is Oakland Township such a terrible place that Gonser feels it necessary to use the Planning Commission to redefine ‘what we are’ just to satisfy his ego. This entry was posted in Planning and Zoning, Supervisor Gonser and tagged Board of Trustees, Gonser, Oakland Township Board, Planning and Zoning in Oakland Township, Supervisor Gonser, Supervisor Terry Gonser, Terry Gonser on August 29, 2015 by richardjmichalski. At the August 11, 2015 Oakland Township Board meeting, Warren Brown, the current Township Manager, commented on his recent decision to resign. He did not go into specifics, but indicated it was a personal decision. He made many positive comments about Oakland Township. He then made several comments about Supervisor Gonser. He commented on the statements Supervisor Gonser’s made in the Oakland Press announcement regarding his resignation. He saw the Supervisor’s comments as an attempt to take advantage of his (Brown’s) personal decision to leave as a method to advance the Supervisor’s “position”. Mr. Brown commented on how the Board has been fractured, and how he thought the Supervisor should be trying to bring the Township together, not further fractionalizing the community and the Board by his comments in the press. He ended by suggesting that the Supervisor should do the Township a “service” and follow his example and resign from office. “It is unfortunate that such a negative light (Gonser’s comment in the Oakland Press) has been cast upon the Board of Trustees as a whole, and by way of association, the Township also as a whole. Board members will always disagree on issues, but out of respect for the process, no individual member should separate oneself from the Board as a whole. The Supervisor’s comment . . . was clearly made to personally attack the Board and embarrass the Board as a whole. He has used my very personal decision to advance his own position, which I consider a personal affront, and to which I take great offense. This Township has more advantages than most local governmental agencies in this State. You are financially sound, you have an educated base, you are well situated for someone to offer his or her services in a leadership role. However, this will not occur as long as the ‘voice of one’ outshouts the ‘voice of the many’. Here is an article published on 8/12/15 n the Rochester Post regarding Mr. Brown’s resignation. Here is an article published on 8/14/15 in the Oakland Press regarding Mr. Brown’s resignation and suggestion for Gonser to resign. Why is this important to the citizens of Oakland Township? Supervisor Gonser has repeatedly attempted to change the governance in Oakland Township to one where he would be a “Strong Supervisor” in our Township. The Board has repeatedly rejected his attempts. Warren Brown made his decision to leave for personal reasons. Warren Brown’s assessment of Gonser’s comments in the Oakland Press is very telling. Gonser was attempting to destroy the Board, and push forward his agenda to become the full time (and paid) leader of our Township. All of the Board members indicated their disappointment with Warren Brown’s decision. Gonser simply thanked Warren for coming to our Township. Our previous ‘short term’ manager, Ann Capela, supported Gonser’s philosophy and stated Oakland Township’s form of governance’ is “bizarre” and “unworkable”. Warren Brown’s statement makes it clear that the form of governance is not the issue, Supervisor Gonser is the issue. Hopefully, our Township Board takes the time to fill the Township Manager position. Former Trustee Marc Edwards suggested having the Township contact the Michigan Townships Association, and find a temporary manager to fill the position until a new Board is elected in November of 2016. Hopefully Gonser will be gone by then by following Mr. Brown’s suggestion, and does us all a ‘service’ by leaving now. This entry was posted in Board of Trustees, Board split?, Supervisor Gonser and tagged Abuse of Power, Board of Trustees, Gonser, oakland township, Oakland Township Board, Oakland Township Board split, Supervisor Gonser, Supervisor Terry Gonser, Terry Gonser on August 12, 2015 by richardjmichalski. Oakland Township loses another Township Manager – What or who is ‘root cause’ for turnover? Oakland Township is yet again faced with trying to find a good candidate to fill the Township manager position. Supervisor Gonser has repeatedly tried to change the stucture of Oakland Township to one where he would be the “Strong Supervisor” rather than the one we have had for years with a “Strong Manager”. That form had served our Township well for many years prior to Supervisor Gonser’s election. In two and one half years, we have gone through three Township managers. Jim Creech, Ann Capela and Warren Brown. Jim Creech served our Township well for 15 years. Three Township Trustees have resigned. Our Fire Chief for many years resigned. Unions have been created in our firefighters and Parks and Recreation staff. Our knowledgeable and experienced Planning Commission members have been, or are all being, replaced. Most of our knowledgeable and experienced Zoning Board of Appeals members have been replaced. Our Planning Consultant has decided to retire from serving Oakland Township, but not other communities. The Township changed legal firms representing our Township. Our legal expense has almost doubled since the new Board took office. Our Planning Administrator is planning on leaving to become the City Manager for Marine City. Our original Township Board recording secretary quit, but continues to support the Parks and Recreation Commission. The Township Supervisor attempted to take over responsibility the Parks and Recreation Commission had successfully managed for years. The Parks and Recreation Commission retained their original legal firm. Two Parks and Recreation Commission members filed a lawsuit against several other Parks and Recreation Commission members. The Township Board legally challenged the formation of the Parks and Recreation union. A Trustee and a Parks and Recreation Commission member shared ‘Privileged and Confidential’ material with others. The Supervisor did not find anything wrong with having received the inappropriate “Privileged and Confidential” material, or that the information had been sent, by a Trustee, to others. The Board repudiated the behavior of the Trustee and called the Supervisor’s inaction ‘improper’ regarding the sharing of Privileged and Confidential material. After investigating several alleged Open Meeting Act violations, the Prosecutors office determined that “two of the matters may have been violations” and proceeded to make recommendations to the Board on how they should have handled it. The Supervisor publicly apologized for making slanderous comments about a former Trustee. The Supervisor accused other Board members of Open Meeting Act violation. The Board approved covering the legal expense for a legal request that the Supervisor made ‘as an individual’. The Supervisor did not recuse himself in the vote to have the Township pay the legal expense for the legal request he made ‘as an individual’. There are multiple lawsuits involving Oakland Township at the County and Federal levels regarding the Blossom Ridge Senior development. The Township has taken legal action against the non-profit Clinton River Watershed Council over the Millrace issue. All of these items have occurred since our new Board was elected. The things that have gone on in our Township over the past two and one half years indicate that we certainly are not the Township we were prior to Supervisor Gonser and the Board taking office. The citizens need to determine if they think we are better off now, then what we were before they took office. Over the past two and one half years, the Board has repeatedly indicated that they want a ‘Strong Manager’ form of governance in Oakland Township. They passed a resolution restating ordinance 97 to reaffirm their desire to have that form of governance. Supervisor Gonser continues to want to act as a “Strong Supervisor”. This may have been a contributing factor in Warren Brown’s decision to resign. The rationale for having a “Strong Manager” form of government has been reported on this website many times (see below). To be fair, over the past 12 months, some of the Board members have seen the “the errors of their previous ways”, and have taken steps to change the direction that Supervisor Gonser was leading them. With the resignation of Maureen Thalmann, the Board appears to be moving in a positive direction. All of them ultimately will be held accountable for their actions. So where do we go from here? It will be interesting to see what the Board decides to do at the next Board meeting on August 11, 2015. Stay tuned. This may be as interesting as watching the Republican debates on August 6th. Supervisor Gonser appears to place blame on the Board for the turnover in the manager’s position. Did his repeated attempts at trying to change the structure of Oakland Township and his interaction with Mr. Brown play a role in Mr. Brown’s decision to leave? Is Oakland Township the “Animal Farm”? Every day, I think the answer is becoming more and more clear. We have a little more than one year of ‘damage control’ before our next election. Hopefully we will ‘choose wisely’ next time. This entry was posted in Board of Trustees, Board split?, Supervisor Gonser and tagged Board of Trustees, Gonser, oakland township, Oakland Township Board, Supervisor Gonser, Supervisor Terry Gonser, Terry Gonser on August 6, 2015 by richardjmichalski.